$0.60 per wedding menu. Minimum order quantity of 25. 5.5" x 8.5" wedding menus. 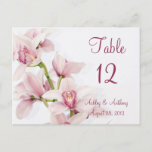 Elegant and beautiful pink, green, and white Cymbidium orchid floral wedding or special occasion menu cards. You can personalize the text using the tools on the Zazzle website. A beautiful and elegant menu for a wedding in the spring, summer, or winter or for any other special occasion such as a retirement, anniversary, or birthday party. Orchids are popular tropical flowers. 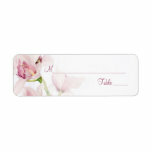 The colors in this soft and romantic design are pink, green, and white. 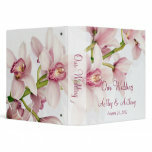 Zazzle value foldable wedding programs, menus, and flyers are perfect for your special occasion or advertising needs! 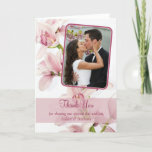 Zazzle value wedding programs, menus, and flyers are digitally printed in high quality full-color and full-bleed on two sides. Two sided printing is free! You can see the backside of the product on the Zazzle website. Colors are vibrant and designs are crisp. You don't have to buy multiples of the same wedding programs, menus, and flyers to receive a quantity discount. You'll receive a quantity discount on any order of 25 or more. For example, if you purchase 50 programs and 50 matching menus, the volume discount is 20%. This invitation is , but you can actually customize it to choose from 8 different sizes. Note: Not all designs are proportionally suited to other invitation sizes. 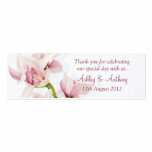 Zazzle designs are all flat printed designs without any three dimensional or raised elements. Zazzle products are printed and shipped in the US, even if ordered off of international sites. Please allow sufficient time for international shipping. This glossy 100lb cover-weight paper is a nice paper to use for wedding menus because it is a firm paper weight. It can also be used for DIY fan wedding programs. This thick paper can also be used as a high impact flyer. Smaller paper sizes work best. Designs come out vibrant and crisp! Zazzle's basic paper contains 50% recycled content.